McClellan, Dave with Karen McClellan. 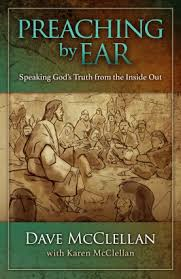 Preaching by Ear: Speaking God’s Truth from the Inside Out. Wooster, OH: Weaver Book Company, 2014, 171 pp. Here is a book on preaching that will make you think about your approach to sermon preparation and delivery. The author writes about his journey as a preacher and how he learned about connecting with the message and connecting with the people in such a way that they can hear and understand what he is saying. The book is divided into two main parts; 1) Preparing the Preacher and 2) Developing an Orally Based Model of Preaching. Within these two sections are nine chapters. The book also has a prologue, epilogue, bibliography, Scripture index and general index. The author uses footnotes which help the reader look at the source. McClellan uses and defines the term “preaching by ear” as speaking from personally held, deep convictions in a way that enables our words to unfold in the moment by considering the actural people present with us. We are well-prepared, but we’re not certain exactly how it will come out of our mouths (p. 5). “Orality” is another term defined and used in the book. One good reason for reading the book will be to learn these terms if you are not familiar with them. Many people preparing for missionary service are probably familiar with “orality” or “storying.” Pastors should know these terms also. Better yet they should understand how to use them and how they can impact their ministries. McCellan shares his understanding of these terms and how the process developed in his life and ministry. He seems passionate about wanting pastors’ lives to be impacted by the Word so that they live it, feel it, and embrace it. Then they need to know their people so they can connect with them in a believable way. One interesting thing for me was learning a little more about Aristotle and about someone I never heard of before, Quintilian. I’ll encourage you to get the book and read to learn more about these men and they have impacted communication. Much of the information in this book I have studied in different forms. I did learn some new things and would encourage pastors to read this book with both an engaged mind and heart. There are truths here that will benefit today’s preachers. I recommend this book to those looking for a new and good book on preaching. I would read it again. I received this book from www.crossfocusedreviews.com for free and was not required to give a positive review.